integrated seat clamp, new MK bridges on chain & seat stays and CNCed MK logo on the head tube. 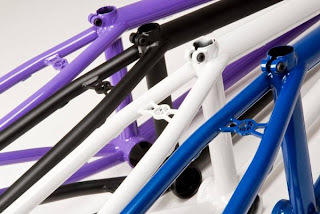 The Mellow frame comes in 20,5tt, 20,8tt, 21,0tt and in five colours. SS: ø19.0mm x 1.0t*0.7t*1.0t. CS: ø 19.0mm x 1.0t. CS-Length: 13,75” slammed, to 14,25“. Head tube: Full Heat treated. 74.5°. Int. Headset. Rem. gyro tabs. BB: Full Heat treated Mid Size BB. Height: 35mm/1,38” above axel line. Dropouts: Heat treated lasercut, 5mm, 4130 chromoly, 14mm slots. Sink cuts on inside. Angled end caps with vent holes. U-Brake: Removable U-Brake mounts and cable stopper / holder.